In the abstract, I think that valentines for dogs are kind of dumb; yes, Christmas and Easter stuff too. But once I see the latest creations the pet market has designed to entice us, I always find myself buying one or more of the cutest, coolest dog specialty for each holiday. I'll share some of this year's valentine favorites with you. This lovely little heart expresses just how most of us feel about our dogs and how they feel about us. So give your best little friend half of this Best Friends Charm for his collar and you wear the other half, or attach it to your key chain. $10 from Haute Dog Boutique. This stunning Tender Heart Collar and Lead can make a statement every day about how you feel towards pooch. 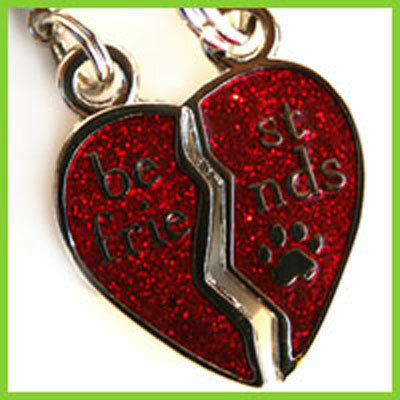 (And the Best Friend Charm, above, would lend just the right amount of bling to it.) Leather collar with molded leather hearts, silver ornaments and red stitching, comes with nickel hardware. $89 for collar and lead, $59 for lead, and $35 for the collar... all from HauteDog Boutique. You have one chance to guess what this is. I was hoping it might be some luscious dog treats.... Actually it's a soft, cushy dog toy that squeaks. It's pretty clever, no? And dogs love squeak and soft, so I think it's a winner. $14 at Haute Dog Boutique. Talk about mis-guessing... 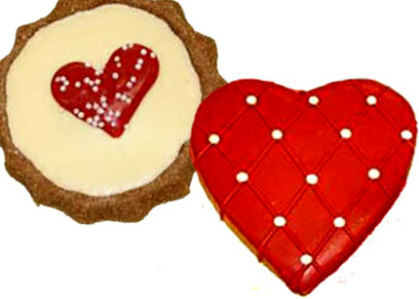 The two cookies above were displayed separately on Pawsitively Gourmet, and I thought maybe the Quilted Heart was another plush dog toy. Aren't these stunning cookies? All ingredients are safe for and tasty to your dog. Check ingredients, however, in case your dog has specific allergies. Only $2 for each cookie. Yum. These goodies are peanut butter bon bons wrapped in yogurt. Sounds good to me! All natural ingredients and beautifully adorned, these Valentine treats are available from Perky Paws Cafe for $5.95 (2.5 oz) or $12.50 (8 oz.). 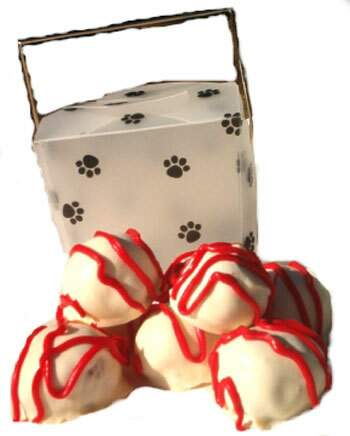 If you're looking for a Valentine's gift basket of edible treats for dogs, Pampered Paw Gifts has a nice selection. The Bow Wow Bliss box contains a variety of yummies for your dog and comes beautifully packaged for $15 (medium) or $18 (large). Ooooh, I love this idea! Crunchkins makes a selection of patented edible doggy greeting cards, Crunch Cards, made from rawhide and edible ink. Amazing! 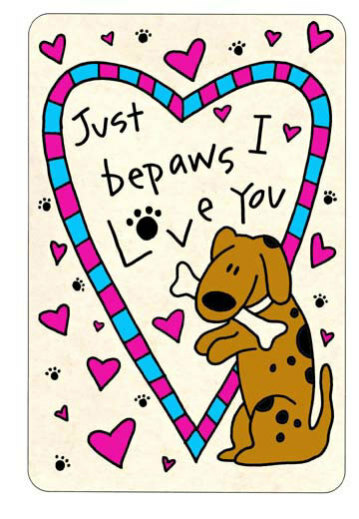 For dogs who love to eat their gifts, buy this or other edible Valentine card from Pet Luv Express for $3.95. 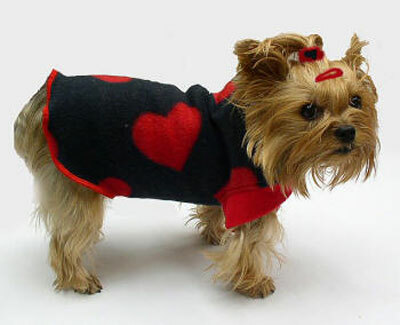 Doesn't this little Valentine jacket suit the Yorkie to perfection? It should; it's custom-made. 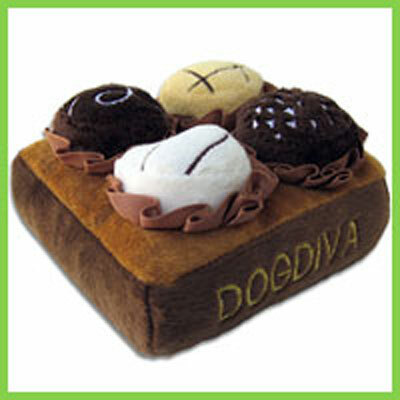 And you can get one for your small dog ( up to 12 pounds) custom-made too. It's black fleece with black and red hearts. comes in regular or princess cut, and costs $32. Monogramming is available for &.50 to $37.50 depending on number of letters. 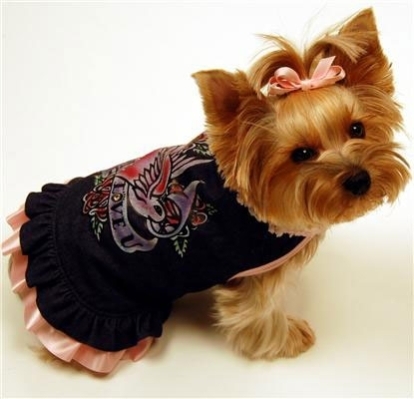 From Designer Small Dog Clothes. 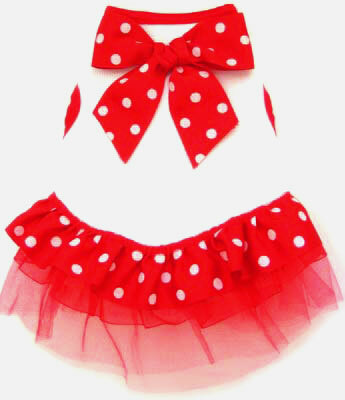 This little pup dress screams Scarlet O'Hara. Whether it's a dinner date with you, or a romantic walk with her beau, your little dog will look her southern belle best in this Sweetheart Dress from Molly and Max. Sized XXSmall to Medium, the darling thing is priced at $34. If your girl's too rough and tumble to carry off the Scarlet look, above, the Valentine Tatoo Jacket will be perfect for her. Feminine enough with pink bow and dress ruffle, the denim coat sports a big "I Love You" tatoo. Jacket is lined and fitted with velcro straps at waist and neck. At Molly and Max for $38, sizes XXSmall to Large. Come to think of it, who better to shower love upon, but the one who loves you best? If you take your dog to the beach, on a hike, or to his favorite dog park, that will be a great Valentine's Day gift for him too. If you can, bring love to a new dog this this Valentine's Day, by inviting a shelter dog into your home. Thanks for the cute post, Meg! So that is why we do all these gifts, to make the tails wag and to hear the purrs, they loves us no matter if we are rich or poor or skinny or fat. I love my fur kids! 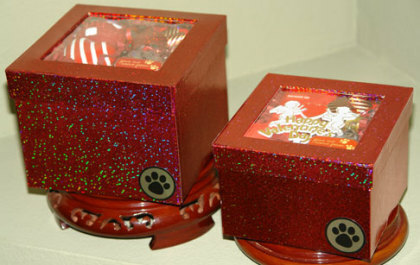 I promise to make every Bow wow bliss and all our gifts with Love for your Valentine dog or kitty cat.